Occasionally, there comes an iPad app that can take away hours of your spare time. 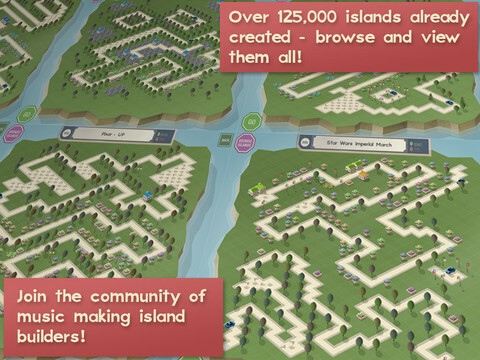 Isle of Tune HD is the latest game to do just that. 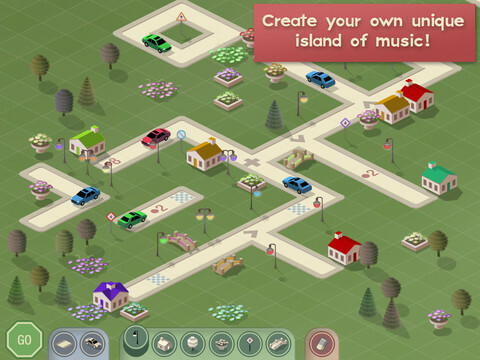 It’s a music app that uses cars, houses, street lights and even bushes to make different sounds. If you’ve ever played Sim City, you’ll be able to create neighborhoods and towns with ease. Everyone else, however, will need to play around with it to figure out which objects to use and where to put them. Once you get the hang of it, you’ll at least have the skills needed to create original songs that you can share with other players. There are two modes in Isle of Tune HD: basic and keyboard. Basic mode is where you should start first. The tones are preset and is great for those who just want to create a town and bear witness to the sounds it makes. If you’re wanting to go the distance, keyboard mode gives you multiple options to tweak the sounds even further. You can change the notes of objects, add delays, adjust the speed of the cars, among others to create complex tracks or even a cover of your favorite songs. If you still can’t figure out what to do, Isle of Tune has a sharing feature that allows users to upload their creations. This gives newcomers an idea of what can be done, but certain songs can come off as overwhelming when you see the amounts of items on screen. As stated earlier, this app is capable of taking hours of your free time away. Overall, once you’ve finished a song it’s a huge reward in itself and the fact that you can share it makes it even better. There are a few problems that must be addressed. The first being that Isle of Tune started out as a PC game. The controls aren’t as precise on an iPad as they are on a computer, but it’s a minor hiccup. Those with musical knowledge may get turned off by the limited number of features and the way songs are made. Also, asking somebody to buy an application that’s free online is a tough pitch to make. Those who’ve played the free version may or may not be interested in the extra features in the iPad version. Overall, Isle of Tune HD is a unique experience that’s fun and worth the $2.99 if you want to take it with you everywhere. The controls take some time to understand, but once you do it’s all down hill from there. If you’re not sure if you want to buy the iPad app, you can play around with the PC application for free online. What you get with the HD version is extra music features and the ability to play offline when you want to. Isle of Tunes may not be for everyone, but it’s unlike any other music sequencer available. Besides, who doesn’t like making a city that has its own cheerful, digital sound? AppSafari review of Isle of Tune HD was written by Joe Seifi on November 27th, 2011 and categorized under App Store, Games, iPad apps, Music, Resource Management. Page viewed 5327 times, 1 so far today. Need help on using these apps? Please read the Help Page. Wow its amazing ……………..awesome graphics…………..